Serious Sam is a high-adrenaline arcade-action shooter heavily focused on frantic arcade-style action. Steamworks – Fully integrated with Steam powered servers, game browser, achievements, leaderboards, and more! Frantic Arcade-Style Action – Fight your way through nightmarish warriors in Mental's army, including old favorites like the Beheaded Kamikaze, Sirian Werebull, Kleer Skeleton and new forgotten baddies that somehow got lost in time. Battle it out with three of Mental's fiercest generals to save the day or die trying! Various Environments and Secrets – Unleash mayhem in 4 spectacular locations: Ancient Egypt, Mayan Civilization, Persian Empire and Medieval Europe. Discover over 100 secrets spread throughout the battlefield! Special Weapons and Power-Ups – Wreak havoc with a huge arsenal of weapons including the classics such as the Double Shotgun, Minigun, Sniper Rifle and Cannon! Co-Op Multiplayer – Embrace the chaos with up to 42 players! Play through the entire campaign with your closest friends or enemies! Survival – Try your luck at the brand new Survival gamemode! Versus Multiplayer – Drop the gauntlet and let the heavy ordinance fly in the classic Deathmatch and Scorematch, and when you've had enough of that, try out the all-new game modes unique to Revolution: Team Deathmatch, Capture-the-Flag, Control Zone and more! Massive Updates – Fully updated engine with hundreds of bug fixes. Full 64-bit Compatibility – Run on the latest versions of Windows with a fully working editor! Advanced Shader Support – Write your own OpenGL shader programs and apply them in your levels! Level Editor – Create your own levels, mods, textures and other content with the inclusion of the fully featured Serious Editor and the Serious Modeler! ​Serious Sam Classics: Revolution is a unified version of the Croteam’s original Serious Sam Classic: The First Encounter and Serious Sam Classic: The Second Encounter experience, which is currently in development by Alligator Pit, an indie development team made of Serious Sam fans with the support of Croteam. Serious Sam Classics: Revolution, along with newly developed content by Alligator Pit, also includes all levels from both Classics and is powered by an updated Serious Engine 1 featuring all-new advanced graphics shader support, full 64-bit compatibility, full Steamworks integration, and lots of bug fixes for a superior game experience. Serious Sam Classics: Revolution is a standalone product and it is completely free to those Steam users that already own both original Serious Sam Classic games on Steam (Serious Sam Classic: The First Encounter and Serious Sam Classic: The Second Encounter). Development team Alligator Pit is comprised of Angelo, Rakanishu, Bromvlieg, Solais and many other dedicated Serious Sam fans from around the world. 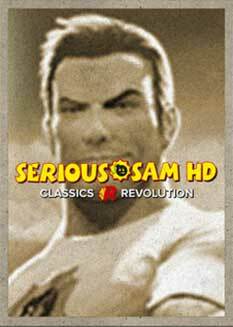 Serious Sam is a high-adrenaline old-school arcade-action shooter heavily focused on frantic arcade-style action. Serious Sam travels through the beautiful landscapes of Ancient Egypt, Mayan Civilization, Persian Empire and Medieval Europe, confronting the countless numbers of Mental’s hordes hell-bent on destroying the human race. You are Sam “Serious” Stone. Welcome to the fight! A brand new campaign with new and exciting enemies, environments and a special ending boss! The beloved Plasmagun and Minelayer from the Warped mod! Even more new and refined gamemodes! Even moooooore achievements, and icons for them! A fully featured scripting engine for advanced mod creation! More OpenGL shader integration like post processing and more! More versus maps and fixes to the current ones based on user feedback! For modders, we’ll be adding a set of tutorial maps to showcase the new features we’ve added to the engine!